We understand that with so many cases to choose from, the choice may be bewildering. We hope you find the information below helpful, but if you need advice please call us on 0117 905 5034 or email sales@casemarket.co.uk and one of our staff will be happy to help. For general queries, please try our FAQs page. With IP ratings and lifetime warranties, these lockable, hard plastic cases are virtually indestructible, making them most suitable for the outdoors - TV broadcast, emergency services, military, environmental testing, oil & gas industries etc. Also the number one choice for photographers on the move. Layers of foam fill the base of the case, pre-scored into 1cm cubes - simply remove the unwanted cubes of foam to fit snugly around the kit. A set of foam pads with hook and loop fabric - adjust and reconfigure as often as you like - the best option for kit that needs protecting but will be taken in and out of the case often, e.g. : cameras. Lighter than our waterproof cases yet built to last, these cases are ideal for basic storage, packaging and transportation. 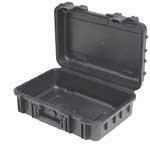 Lockable, stackable, with rubber seals in the lids, unaffected by temperature and easy to clean. Designed to house rackable equipment such as servers and amplifiers, we supply standard 19" racks, shockmount racks and removable shock racks. Our lightest plastic cases, in lots of bright colours, these are most commonly used by marketing and sales professionals for displaying materials and promoting products. Once you have decided which type of case is right for you, you need to work out the correct size. Start by laying your kit out on a table in the way you wish to place it in the case. It's not always possible to find a case which has all three dimensions exactly as you want them, so experiment with different ways of positioning items if possible. Internal dimensions should be taken as the maximum usable space - please note that the usable space may be less at the points where wheels, handles etc. are fitted. All specs show the dimensions in millimetres as Length x Width x Height/Depth. The Height/Depth applies to the whole case - a breakdown of the internal lid/base dimensions can be found in each individual product page. All specs show the dimensions in millimetres as Length x Width x Height/Depth. The width is always 19" (483 mm). The rackable depth is the distance from front rail to back rail. The height is normally measured in U Size. U or RU means Unit or Rack Unit. It describes the height of the rack case or of the piece of equipment being mounted inside. 1U is 1.75 inches or 44.45 mm high.